I first became a fan of the talented Catholic mothers and authors, Patti Armstrong and Theresa Thomas, when I wrote a review HERE for their first book titled, Stories for the Homeschool Heart. Fast forward a few years and these ladies have teamed up once again to continue to fill our hearts, minds, souls, families, and bookshelves with an endless supply of wisdom, faith, honesty and life-affirming beauty. I had the incredible honor and privilege to read their soon-to-be released book, Big Hearted: Inspiring Stories for Everyday Families. Like their first book, this project includes many contributors as they each tell their stories of how God opened their hearts to become bigger and better than they could ever have imagined. 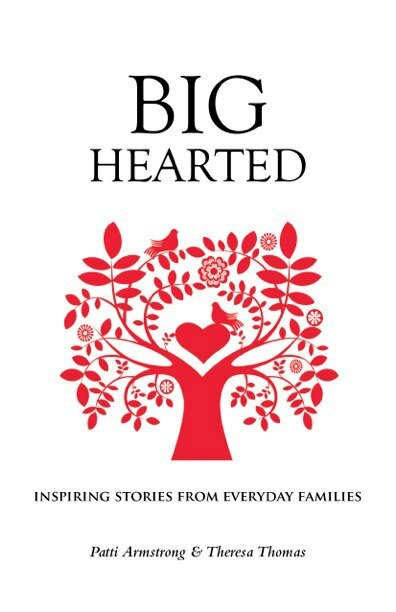 I sat down one quiet evening while my husband took my four children out and read Big Hearted...all.in.one.sitting! Yes, it was that good! I knew I was about to read a treasure as soon as I read Armstrong's and Thomas' words in their introduction: "The families in this book are just like ours, and probably just like yours, too. The similarity is not necessarily the outer details-every family is unique; it's the goal of striving to put God first, of trying to love well." That line drew me in immediately and I couldn't wait to see how Big Hearted would inspire me to love my family even more! In the 22 different stories that were collected from various authors, I enjoyed not only peeking into another family's life filled with triumphs and struggles, but I went away from each story inspired to apply their life lessons into my own family's life. I enjoyed reading the story contributions from Armstrong and Thomas themselves as they made me smile and grateful for my own little answered prayers and miracles that God has given my family. I loved how each contributor in Big Hearted spoke from their hearts and their real and transparent feelings came through with many of their struggles. What a blessing it is to know that I can relate to parts of families' stories without knowing them personally! I realized with each story that no family is perfect, including mine, but each family in the story was perfectly blessed by being open to God's will and ways. I found myself anxiously turning each page as I smiled, chuckled, sobbed and was in awe not knowing how each family's real life adventure would end by the last line. As a busy mom of four children and one due in early August 2013, I find it difficult to find time to read for pleasure. However, Big Hearted not only had stories to keep my attention, but their short lengths kept me wanting to read the next story until I finished the book. I love the fact that Big Hearted is a great book for moms and dads that have big responsibilities and often find it challenging to get a little time for themselves. But, since you don't necessarily have to read the book cover to cover since each story has its on plot and lesson, you will easily be able to read one or two stories at a time when you get 5 or 10 minutes and want to be blessed knowing how God works in big ways in others' hearts. I encourage all families to read Big Hearted because while all our families are special and unique, we can all be inspired to put God and love first. Big Hearted would make a great Mother's Day gift or a gift for someone you know that wants to be inspired to read the blessings and miracles that can come from having a generous heart! Be sure to visit and "Like" Big Hearted Families Facebook page for even more ways to be encouraged to put God first and "love well!" May 1, receive 15% off the retail price! Phone orders only. Click HERE to read a full description. Thanks, Tracy, for your wonderful review. It means so much coming from you--a talented and beautiful mother and writer. God bless you! Great review, Tracy! I'm sold:) I'll have to look into getting a copy for myself and maybe some gifts too. It sounds like inspiration that I could use. Happy Good Shepherd Sunday!